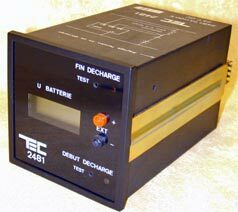 The relay 2481 is a measuring instrument for the direct voltage and current supplied by a battery pack. It is made to check the charge and the discharge of the batteries. - LCD display with 4 digits and 1/2 - 20.000 points. - the display and the voltage and current relays should not give false data in the range between the discharge end and 30% of the nominal value. - Voltage threshold relay, set by multi-revolution potentiometer with access by screwdriver from the box outside. - A LED on front face displays the relay state. This LED is in series with a NC contact. - Threshold accuracy : +/- 0,5% of the setting. - The discharge current detection id made with a 100 mV shunt in series with the battery. The threshold is set in factory at 10 mV. - Detection circuit holds 2 V during 1 sec. - Relay 1813 directly soldered on the PCB. - The relay is ON after a time delay of 120 sec. (+/- 15%). Time delay modifiable in factory. - Time delay repetitiveness : +/- 5%. - the relay 2481 sends a current of some mA through the shunt. Then an electronic threshold circuit permits to detect if the current checking circuit is correctly connected. - In case of link breaking, the discharge beginning relay is ON after a time delay of 2 min. (So the discharge beginning relay has two functions : discharge current detection and checking of the link between shunt and 2481 relay). A push-button "discharge end" permits to de-energise the related relay. A push-button "discharge beginning" permits to energise the related relay. 2 EXT + and - terminals permit to connect a power supply equal to the 2481 range (between 50 ad 100% of the power supply setting). This power supply energises a relay which switches the measure circuits on this one. It permits to check the LCD display and the threshold (and, if necessary, its setting).